Size 34 Inch By 1 1/2 Inch Width - White. Will Fit Neck Size 32 Inches to 36 Inches. Tags: German shepherd collar, dog Collars gsdsite, dog collar, leather dog collar, reflective dog collar, dog collar with handle , large dog collar, dog training collar, schutzhund collar, agitation collar Dean & Tyler Leather Dog Collar "SILVER FIRE"
Silver Fire, our hand-made collar of full-grain leather, comes decorated with row of vertical nickel plates with etched edges. I want to let you know about a great classified ad I have just found. 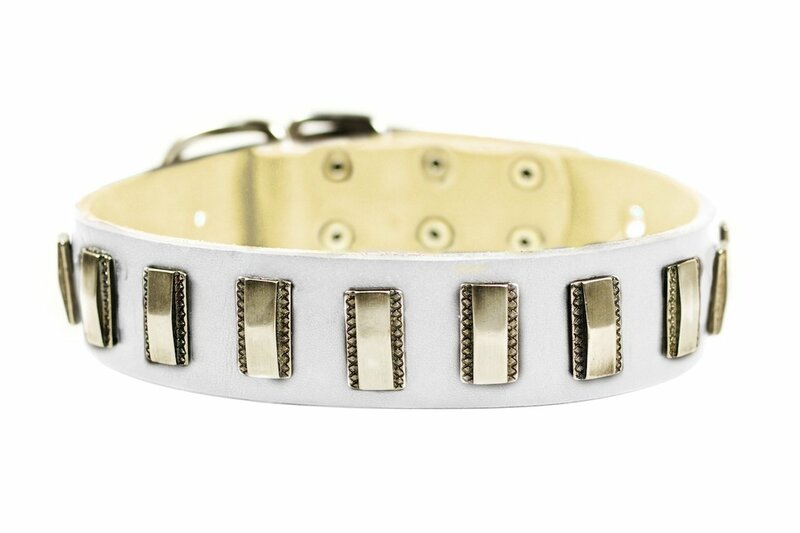 This classified may be found at https://gsdsite.com/ads-2014/dean--tyler-leather-dog-collar-silver-fire.html. Title of the classified: Dean & Tyler Leather Dog Collar "SILVER FIRE"